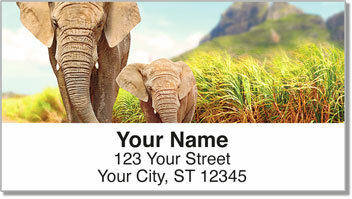 Illustrations of the largest living land creature make for an original set of return address labels for animal lovers. Elephants are truly amazing! They drink 50 gallons of water and eat 400 pounds worth of food every day! Their skin is an inch think and their brains can weigh ten pounds! But some of the most astounding facts about elephants have nothing to do with their enormity. Elephants are affectionate animals that nuzzle trunks with their mates and mourn the loss of family. 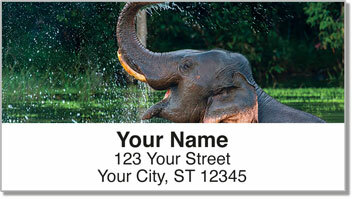 Elephant Address Labels seem to capture that part of the pachyderm's personality. You'll never forget to use these handy labels to easily stick your name and address on every envelope you mail. 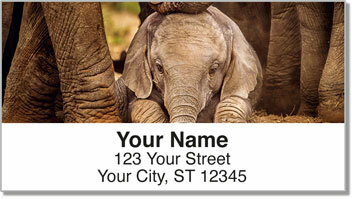 Get your very own Elephant Address Labels today! 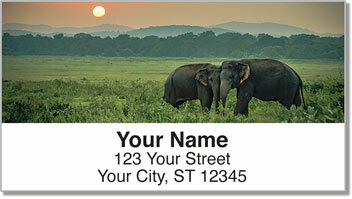 This wildlife design is also available as a set of matching personal checks.